The SOLIDWORKS Settings (for Autopilot) is available from the settings of DriveWorks Autopilot. The autopilot feature in DriveWorks Autopilot has the ability to automatically generate SOLIDWORKS models, send emails, and process specifications. Each of these three activities (or queues) can be turned on or off independently. With this option checked SOLIDWORKS will generate the models. If this option is not checked then Autopilot will only release specification and will not start SOLIDWORKS. In this case another Autopilot will need to set SOLIDWORKS to generate. Load balancing is the ability to process tasks across multiple DriveWorks Autopilot machines. Load balancing ensures that when a task is picked up to be processed by one DriveWorks Autopilot, then another DriveWorks Autopilot will not try and process the same task. Load balancing is only supported on Shared Groups. Tagging is the ability to target DriveWorks Autopilot to process a specific task. See Autopilot for more information. This is the number of times that DriveWorks Autopilot will attempt to generate the models if an issue occurs. If after all attempts the model is not generate DriveWorks Autopilot will move on to the next model and will flag the failed component. This should be set according to the size of the model set being generated. SOLIDWORKS can be restarted after a certain number or models. This is to be used if large assemblies are being generated and it is beginning to run slowly. This will slow down the time taken to generate the models so the setting must be adjusted to suit your preferences. DriveWorks Autopilot can restart SOLIDWORKS after a certain time without a response and also after every batch of models has been generated. In all cases DriveWorks Autopilot will pause the generation process and will start up again once SOLIDWORKS has been re-launched. With this option checked DriveWorks Autopilot will stop any SOLIDWORKS message boxes during the model generation process. If you choose to do this then all message boxes will not be shown and default selections will be assumed. 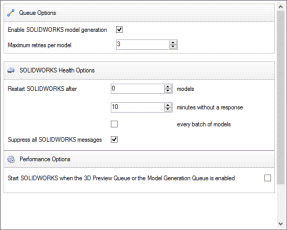 This setting will be used the next time DriveWorks Server opens SOLIDWORKS. With this option checked when you click Start in Autopilot and either the 3D preview queue OR the model generation queue is enabled, then SOLIDWORKS will automatically start in the background. This option offers a minor performance benefit.